We use My Father's World Curriculum, and love it, BUT their math recommendation of Singapore didn't seem like it would fit my boys (not all boys, just MY boys). It wasn't because Singapore was "too hard", and we wanted a weaker curriculum. The traditional teaching style just didn't fit my visual and tactile learners. 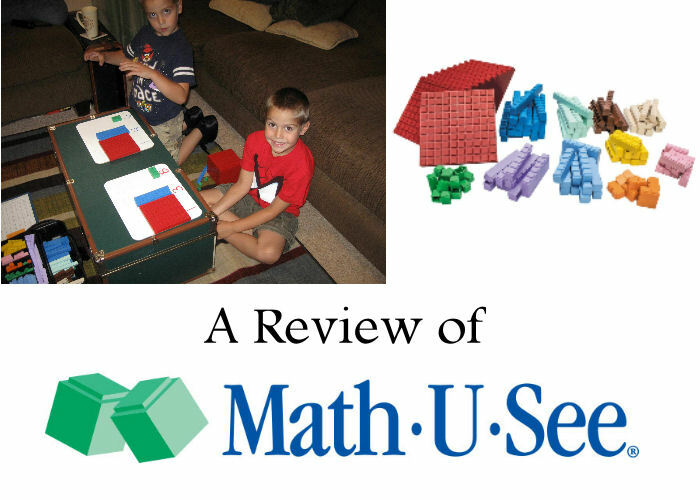 On recommendation from a friend, we tried the Math U See (MUS) Kindergarten. Many said we could just try Primer level for K solid teaching on place value concepts, and easily switch later if it wasn't the right fit. We liked the solid foundation of the WHY behind place value so much, we never went back. We've been using MATH U SEE for 5 years now. We have ups and downs, tears and triumphs. We still use it because it explains the WHY behind math. Even through the frustrations, we still choose it because I believe there isn't a perfect mythological curriculum that will magically make math easy and wonderful every day of the year. Math is hard, but we work at it. Anything worth learning may require work, and for us the pros outweigh the cons. Math has never come naturally to me. When I was told MUS had a teacher's manual and a DVD teacher, I was super excited. I do have to read the manual, watch the short video alongside them, and usually do some reinforcement activities after the video (all listed in manual with exact wording) for each concept with them, but I feel like the videos really teaches the concept. I often share how I feel like I am relearning the "whys" behind math myself as we watch the videos together. "Build" with the colorful blocks, during DVD lesson and during practice pages. This appeals to visual and kinesthetic learners. "Write" the problems and solutions with the practice pages. This also appeals to visual learners. "Say" by talking through the why of the concept as you build and write, and later showing they have mastered the concept by teaching me, the teacher, how to do it. This is useful to auditory learners, who benefit when they hear their own voice while learning. Math U See is a mastery approach curriculum that explore the WHY behind the math, not just the HOW. Spiral Approach -"In a spiral curriculum, learning is spread out over time rather than being concentrated in shorter periods. In a spiral curriculum, material is revisited repeatedly over months and across grades." This means if the child has not learned the skill, the class still moves on, with hopes that when it is revisited later in the year, or the next grade, they will get it then. With a large classroom of 30 plus kids, I can't imagine doing it any other way. Kudos to AMAZING public school teachers who do make this work. Thankfully, I have a classroom of only two, and can choose what works best for my specific children. I was attracted to a Mastery Approach based on my own experience in elementary math . I remember vividly getting stuck multiplication tables, and never being able to catch back up when they moved on. While the spiral approach does circle back around, but it is done at a higher & more complicated level. By that time I was still so far behind, and ashamed for being that far behind, that I just couldn't catch up. I didn't want that for my boys. For more on Mastery versus Spiral Approach, click here. Another aspect to Mastery approach is there are no grade levels, which means no stressing about finishing , or NOT finishing, a book in a year. You literally go at the pace your child needs. We did Primer in only 4 months. We finished Alpha (addition) in one school year, plus LOTS of summer review We finished Beta (subtraction) in only 2/3 a school year, and Gamma (multiplication) was almost was the death of me because it took a year and a half, but it was worth it. One con of mastery approach is sometimes you just get STUCK. I felt like we would NEVER finish Gamma!!!!!!! It took us a year and half, plus 3 months off taking a break to just read Life of Fred math books because we were all frustrated, BUT like always in MUS, I am so glad we didn't give up. All the work in mastering multiplication facts has meant we are FLYING through Delta. The mastering of the facts is paying off, they know the WHY, so the HOW comes easily. We had a similar experience in addition (Alpha), then flew through subtraction. To those MUS moms who want to throw in the towel on addition or multiplication, keep going. Trust the hard work in mastering the facts now will make your life so much easier later on! Some critics say there isn't enough review in mastery approach. I would disagree on two points. Mastery approach is based on scaffolding, meaning they build upon each other. You review past concepts every time you do another, because you HAVE to to get the problem correct. Every lesson has 3 practice pages for your current concept, then 3 pages of review, and one enrichment page. The review pages review earlier concepts you've learned in that book. If my boys were struggling with a review page, then that alerted me we needed to go back and review the WHY of an earlier lesson in that book, which we have done on several occasions. When we are between lessons, I use the free worksheet generator on the Math U See website to print a few review questions for review drills. We do love our MUS curriculum, but there are a lot people it just doesn't work for. One friend of mine told me that it didn't seem to work if she jumped into in later grades. Since it is a mastery program, the scaffolding built in earlier is necessary to understand in later books. That said, a mastery approach means the books are not by grade level, so in theory, you child could "catch up" pretty easily. If your child plans to enter into public school soon, MUS may not necessarily be for you. Majority of public schools use spiral approach, not mastery. Think about looking into Saxon or Abeka. If I sent my kids into public school now, they would technically be "behind" most public school 4th graders because we have yet to learn decimals. I have no problem with that because I know once they have TRULY mastered place value, multiplication, and division, then decimals will be a breeze. If I am wrong in these the trasntion into public school using MUS, I sincerely would love feedback. I welcome any homeschooling families have put their kids back into public school after using MUS, please comment below on your child's experience. We are entering into 5th grade next year. For now, I wholeheartedly recommend MUS as an elementary math curriculum. Your child will have a solid foundation of the "whys" of math. My plan for now is to continue with MUS, but that may change as we get into Junior High and High School. We plan to go through General Math, the consider if their secondary Math is still appropriate for us. A few other MUS mothers have told me that use through junior high, then switched for high school. If you are a mother with this experience, please comment below, I'd love to hear your experience. Some homeschooling families were upset when Math U See aligned with CC. What we have found the main teaching of MUS has not changed. The only change I have seen is the Enrichment pages have incorporated more English and writing. Anytime the Enrichment page had "new math" approach that just didn't make sense to us, we just skip it without it effecting any other learning. Let me know about your experience with MATH U SEE below in comments! Thanks! I love math u see! My youngest daughter just doesn't 'get' math. As a last ditch effort at her ever really learning math I started looking into MUS. Confused on which level to start her in I emailed the helpline at the company and have both emailed and spoken on the phone with s lady there that has been so helpful. We've been working our way through Alpha (even though we were starting halfway through her 4th grade year) so that we can make sure she hasn't missed anything and she truly understands. It's totally crazy, but she likes it. The MUS rep talked to me a long time about my daughter's audio processing disorder and how to use this program with her, and how to watch for any signs of frustration so we stop the lesson right there. She actually likes math (I didn't say lives) 😏and her confidence is returning! Wonderful! That is so wonderful to hear! I have such good things about their helpline. We switched to homeschool from public schools at the beginning of high school and started my son in geometry. We initially started with BJU after seeing several curriculums at a local homeschool fair. My son (and I) were lost from Day 1. After an online homeschool fair where MUS was presented, we decided to try it. It was a world of difference from the beginning! My son breezed through the course and we learned where his math weaknesses were. We were able to find used MUS teacher materials to review those items and he is quickly moving through Algebra 2 now. We will have a better idea of where he is after he takes the past this fall, but we feel he is on track with his peers in the ps with a better understanding than many of them.